KiddiesCornerDeals.com is an awesome website created by a Work At Home Mom, Nichol. She has two children, a son who is 10 and a daughter who is 5. Nichols says that before she had her kids, she had a big obsession with designer gear, and spending tons of money. But, that changed. After her son was born, she learned how to shop at clearances, online shopping, and never paying full price. Now she says she has an addiction to online shopping for kids deals, online children’s sales, and home decor. At her site, you can find great deals, coupon, and a well-written blog of her thoughts on various products and companies. 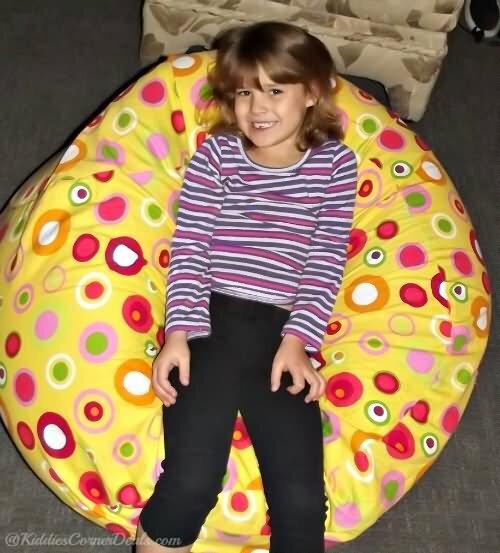 I learned of her site through a friend, and thought "Hey, I would love Nichol to review one of our bean bag chairs for kids!". So, I wrote in and she was gracious enough to not only review our bean bag, but to also add it to her holiday gift guide...even though it was already full! Below are some excerpts from her review. 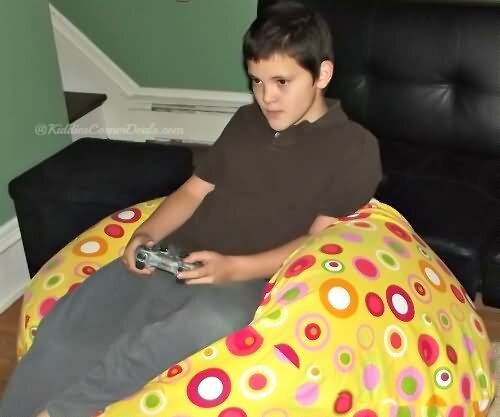 You can find the entire review at http://kiddiescornerdeals.com/2012/12/ahh-bean-bag-furniture-products-review/. "I was a daycare provider for many years, so had to have comfortable seating for the kids. During circle time, story time, movie time and just to relax, bean bag chair furniture provided that comfort for kids of all ages even adults...The kids get their own space to sit and sprawl out and I don’t have to listen arguments over who was sitting there first." "...The moment the huge box arrived with our oversized bubbly citrus cotton polka dot patterned bean bag chair the kids were jumping up and down. Before letting the kids sit and run and jump on it I checked it out. The yellow polka dot is a 100% cotton cover which unzips to remove for easy washing. This is fabulous. 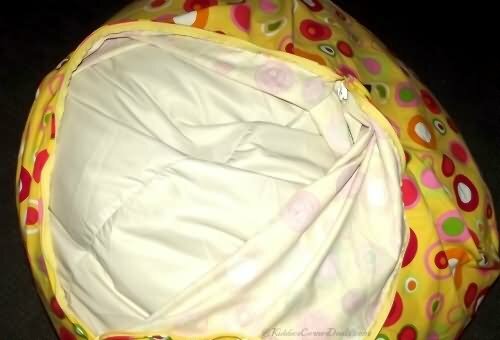 I’ve owned many bean bag chairs without covers and had to spot treat them when they got something on them, so being able to wash the cover is brilliant..."
"Once you unzip you’ll notice another bag which is filled with the filling. This bag is an extremely strong, water-repellent microfiber cover that has a child-resistant zipper so kids cannot open. Love that this feature has been added. I’m an adult and had no clue how to open it..."
"The kids love their new bean bag chair. It is full really full when it arrives but does get a bit more comfortable after use or kids jumping on it. The bag conforms to the body, holding you up for a comfy place to sit. I am very pleased with our AHH! Bean bag chair. Everyone who comes over has to sit it in. They are perfect for video game playing children as well. Great gift idea for children and adults." Super Special Thanks to Nichol for her kind words :) And, by the way, adorable kids!